I first photographed Matthews Mummy and Daddies wedding back in 2014 so I was delighted to hear the news they were expecting. 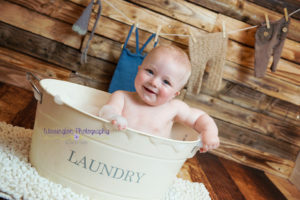 I was made up when they choose me to be Matthew’s newborn photographer in July of 2015, as it is always lovely to see past clients who in essence become like friends. 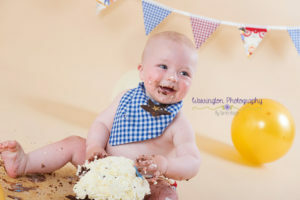 So one year on (I don’t know where time goes) I was so pleased when Matthews family decided to document his first birthday with a cake smash and splash session. We started by taking some photographs of Matthew in the Coca Cola tray we used on his newborn shoot… Just look how he has grown! 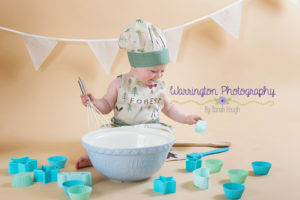 We then set up a little baking scene and popped our first outfit on Matthew an apron and chef hat, matching accessories were added in and he had a great time banging the utensils on the mixing bowl. At this age they love to explore different sounds so it really brought out some great smiles. 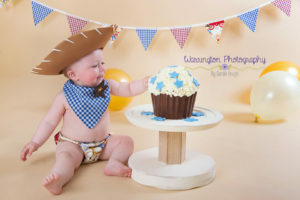 For the next part of the session we decided on a cowboy theme so I set up the cute bunting in the background to match the gorgeous cowboy outfit. When we brought out the cake Matthews little face just lit up and instantly he wanted to eat the blue stars, then we cut him a slice of the chocolate and boy does he love cake! Matthew had so much fun getting messy with the cake it was everywhere! So there was only one thing for it….. This is my favourite part of the session as it gets so many genuine smiles. I set up the laundry tub and a washing line with outfits as the backdrop. We then put Mathew into the tub to clean him up, he had a great time splashing around that we got water everywhere! He loved playing with the rubber ducks too. We then dried him and wrapped him yo into a snugly dressing gown, this is one of my favourites from the session. 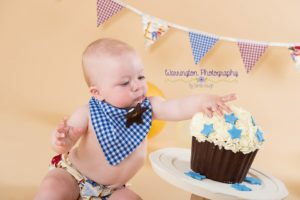 Cake Smash Photography is a fantastic way to capture memories of an early years birthday.